Ann Marie Bryan and audience at the first Origins of Faith lenten lecture. and discovers just how wide the reach of Foothills' busy schedule of services goes. 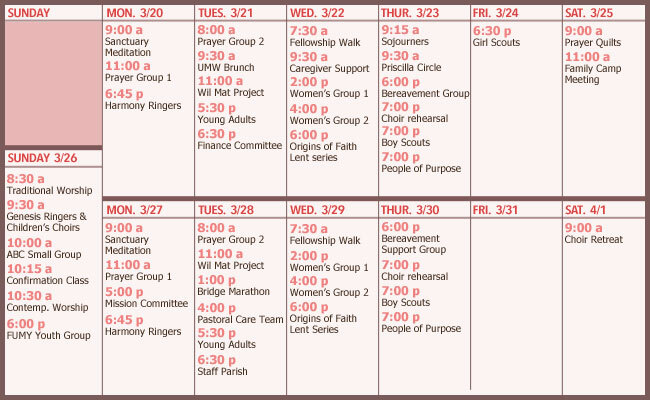 Lent: Where Am I Going? The period called Lent is 40 days of reflection and spiritual preparation finishing with Holy Week and Easter. This Lent at Foothills we will focus on the question "Where Am I Going?" while offering lots of enriching opportunities: On Sundays, witness "Scripture Alive" during worship as actors present the Word. On Mondays, pray and meditate with Pastor Eric in the sanctuary. On Wednesdays, enjoy dinner with friends and then learn about world religions with incredible lectures. Get all the times and details on our website. The EarthCare group is gearing up for Earth Day by hosting a photo competition. Submissions are to be sent to foothills@foothillsumc.org. Parameters for the imagery are pictures of nature that honors or celebrates God's creation. The submission deadline is April 8 and the winner's photo will be framed and put on display somewhere on the church campus. Admin council is held quarterly for members and congregants to gather with the administrative arm of the church, hear progress reports on important matters and vote on the future direction of the church. The next meeting is 4/9 at 6 pm in King Hall. A free meal will be provided to all attendees. The agenda will include a discussion about the possible adoption of El Cajon First United Methodist Church by Foothills for purposes of developing a ministry center. All are welcome and encouraged to attend. Greeters, Hosts, Muggers: Sunday Morning Volunteers Needed! It takes a village to make Sunday mornings run smoothly at Foothills. A small commitment of only 30-60 minutes each month is needed, but may have one of the greatest impacts to growing our church community. If you are able to provide this small amount of time being a host of Foothills, please contact the church office. The annual Mad Hatter's Tea and luncheon is coming on 4/29, from 2:00 - 4:00 pm, hosted at Monte Vista Village. Join in the tea party of the year and support Meals on Wheels San Diego's East County office. Tickets are only $30 to enjoy delicious tea, tasty treats, opportunity drawings and much cheer. RSVPs are due by April 14 and you can contact Marilyn Honea (619-660-2136) to coordinate your attendance. Be sure and wear your most fanciful hat, as there will be a hat parade with prizes! The 2017 Family Camp weekend has been announced for Memorial Day weekend, May 27-29! Sign your family up now for a fun weekend in the sun and the mountains of Julian at Camp Cedar Glen. Take part in family games, a climbing wall, archery, swimming, variety shows, campfires and more. All of the fun will be in the theme 'come together.' The cost is $100 per person with scholarships available. Contact Carla Slater for more information and to sign up. Come explore simple techniques that are designed to help you move forward on your journey to wellness! They can help increase relaxation, reduce pain and anxiety, release trapped emotions, and improve your overall well-being. They are drawn from many types of alternative healing techniques used in hospitals and hospice settings that relieve pain as well as soothe the body, mind and spirit. Join us for an afternoon that was designed for Foothills members to discover new ways to care for yourself and others! Sign up and pay the $25 fee online, for a fun-filled afternoon and learn to bring your body's energy into balance so it can heal itself, naturally! Sunday, 4/2 from 2:00-4:30 pm in King Hall.